Woody Allen never manages to take a break, since the 80-year-old has managed to make a movie once a year for the past 34 uninterrupted years. That’s a pretty damn impressive feat for any director to proudly have, but even so for every good movie he’s made in those years – including Blue Jasmine, Midnight in Paris, and Hannah and Her Sisters among others – he’s made quite a few clunkers as well – namely The Curse of the Jade Scorpion, Cassandra’s Dream and Irrational Man, also among others. But then you also get one or two “in-between” movies of his, ones that don’t quite reach the cinematic heights of some of his other films, but are decent enough to prevent them from being some of his weaker ones as well. Café Society, his latest, fits more into this category. It tells the story of 1930s Hollywood, where a young Jewish man named Bobby (Jesse Eisenberg) arrives from New York to work for his powerhouse agent uncle Phil (Steve Carell). Bobby soon meets Vonnie (Kristen Stewart), Phil’s secretary who seems to resent the higher society she lives in and desires a much more down-to-earth existence, and of course Bobby soon falls for her. However, complications arise when Vonnie reveals she is in fact seeing someone else, and both she and Bobby must deal with their mutual attraction for one another while also facing difficulties with their own relationships, especially when they end up being states apart after a short while. Café Society is definitely a Woody Allen film, one that exhibits his most unique tropes – a neurotic lead character modelled after Allen himself, a farcical dilemma (usually surrounding a beautiful woman), quirky dialogue delivered by an ensemble of quirkier characters, and a deeper meaning behind what appears to be a simpler narrative, to name a few – and plays them about as safely as you could expect. It’s done well in this case, but it still isn’t enough to make this one stand out amongst some of his other more recent works. As it is, however, it’s still a charming little film that doesn’t accomplish much but is just about sewn together by the talented cast working with this regarded filmmaker. Eisenberg is on his second collaboration with Allen, after 2012’s To Rome With Love, and if there ever were to be a more perfect Allen on-screen surrogate, even they would struggle to emulate Eisenberg’s spot-on duplication of the mannerisms and neuroses that the filmmaker has made his own. He also gets to once again share strong on-screen chemistry with Stewart, following their two previous pairings in Adventureland and American Ultra, and Stewart herself is steadily improving as an actress with every new role she is taking on, making her an increasingly interesting performer which this film poignantly reminds us of. Carell too does excellent work in a role that allows him to be melodramatic and also cartoonishly big-headed at the same time, while Blake Lively slows up later as another love interest and is as charming and lovable as ever. There are other turns from Corey Stoll as Eisenberg’s gangster older brother, Parker Posey as a Hollywood acquaintance, and Pitch Perfect’s Anna Camp in an extended sequence as a nervous first-time call girl. As with most of Allen’s all-star cast ensembles, they easily carry the movie on their shoulders and deliver their lines with such dedication and respect for the material, as well as the man behind it all. It also bears the distinction of being one of Allen’s most progressive films in years, at least from a technical standpoint. This is the director’s first film shot exclusively on digital, and also his first collaboration with noted Italian cinematographer Vittorio Storaro, best known for providing the imagery for Francis Ford Coppola’s Apocalypse Now as well as other films like Reds, Last Tango In Paris, The Last Emperor, and dozens of other classics. As you might expect, a genuine film legend like Storaro provides Allen with some of the most gorgeous imagery of his later career, with the crisp high-definition quality of the digital camera painting an even more colourful picture in any location it can think of, from a candlelit dinner table in Hollywood to one-take tracking shots of the interior of a New York nightclub, and even one gorgeous scene set amidst a Central Park backdrop. The film is simply gorgeous to look at, and you can definitely see why someone like Allen would be instantly attracted to the beauty that Storaro bestows among a motion picture. Alas, not even beautiful cinematography can really elevate the material from just being wholly decent. There are not quite as many shocks and sudden turns as there might have needed to be, or at least enough to make it more investing, and each little storyline ends up exactly where it is predicted to end up, mildly and mostly incident-free. Allen’s consistent narration handily fills us in on some exposition, but when it suddenly chimes in during the middle of scenes where it could have done just fine without, it can seem like someone rambling over the very film they’ve created. Then again, 47 films into a career that’s still going strong, maybe Woody Allen has earned the right to ramble as much as he wants to. 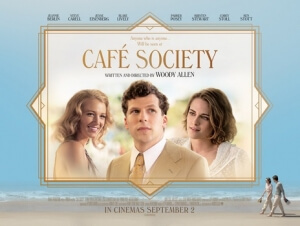 Café Society isn’t one of Woody Allen’s best but nor is it his worst, as the strong ensemble cast works fine with the filmmaker’s reliably neurotic writing, and noted cinematographer Vittorio Storaro takes beautiful advantage of Allen’s first foray into digital filmmaking, but the story and characters aren’t quite as riveting enough to truly leave an impact.